The Battle of Harlem Heights in September 1776 was a morale turning point in the Revolutionary War, particularly after the Americans suffered losses in the Battle of Long Island and at Kips Bay. The Americans and the British skirmished at what is now 106th Street and Broadway and the fighting extended northwards to 125th Street. 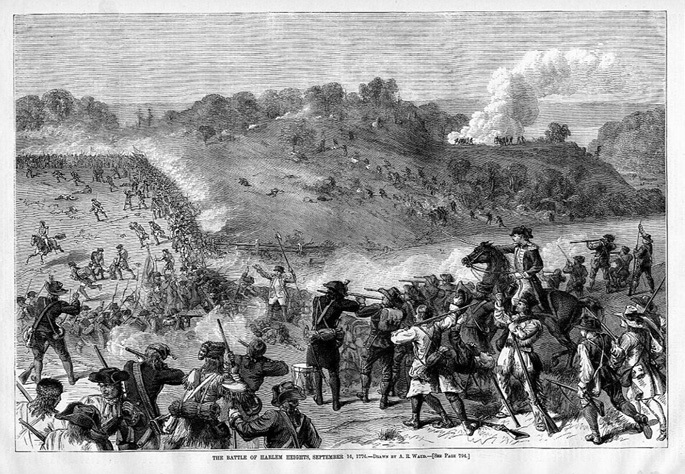 The majority of the battle was fought around 120th Street and Riverside Drive, but the Americans were able to push the British back to 106th Street. George Washington noted of this maneuver, “This little advantage has inspired our troops prodigiously. They find it only requires resolution and good officers to make an enemy give way.” Today, a plaque on Columbia University’s Math Building near 118th Street and Broadway marks the historic battle. 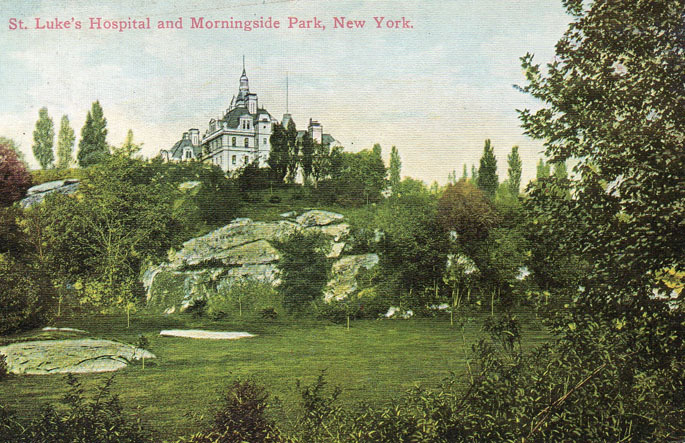 During the colonial era, the land that is now Morningside Heights was farmland. 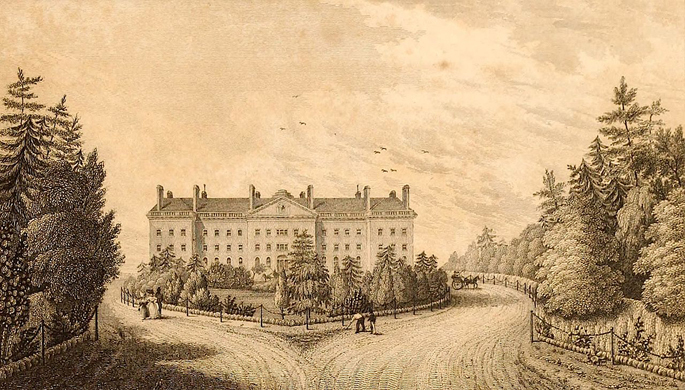 But even before the revolution, things were in motion to create a public hospital in New York. Doctors from Columbia University (then King’s College) petitioned the colonial government and received a charter to build the “Society of the Hospital in the City of New York, in America,” later called the “Society of the New York Hospital.” Between 1816 and 1818, 26 acres of farmland were purchased by the charter organization, which became the Bloomingdale Asylum, named after Bloomingdale Road which is now Broadway. The first building was constructed in 1821 and expansion had commenced by 1826. Bloomingdale Asylum. Image from Public Domain. The bucolic hospital grounds had the federal style building, above, working farms for health therapy, gardens and walks. Additional buildings were constructed over time and the property extended over to where the Cathedral of St. John the Divine is today, where the Leake and Watts Orphan Asylum was located. Not everything was as rosy as it seemed, however. In 1872, the journalist Julian Chambers had himself committed to the asylum and reported on abuse of inmates in The New York Tribune. 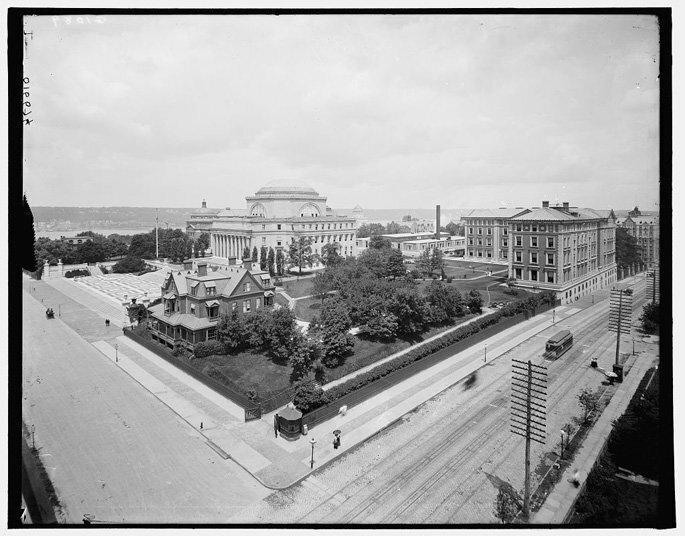 By the 1880s, the asylum had started to sell off land to various institutions, with Columbia University buying up the majority of the property in 1892. The asylum moved upstate to Westchester and became the New York-Presbyterian Hospital/Westchester. Most of the buildings in what was New York Hospital were demolished, but one remains. Right next to Low Library sits Buell Hall, which houses the Maison Française and is used by the Columbia University Graduate School of Architecture, Planning and Preservation. It was built in an elevated architectural style by Ralph Townsend to house wealthy gentlemen suffering from mental afflictions. One fun note is that it’s not in its original location, but was moved to this spot. In the Columbia University archives, you can find photographs of Buell Hall while in the process of behind moved, as well as the campus when it still had some buildings leftover from the hospital. In the photo below from around 1903, a Victorian-style house sits alongside what is now the main alley of the campus. Also note the streetcars, which ran along both Broadway and Amsterdam Avenue. 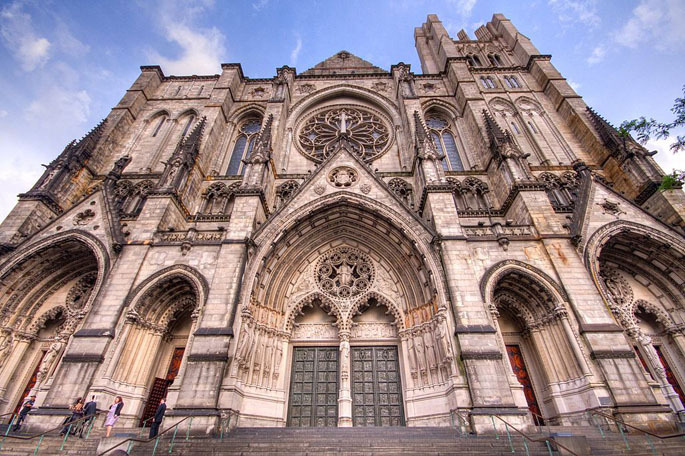 Construction of the Cathedral of St. John the Divine began in 1892, the same year Columbia University purchased the property for its new campus. It claims to be the largest cathedral in the world, meaning a church that is also the seat of a bishop. By length and by volume, it’s one of the five largest churches in the world and was built using authentic Gothic methods and without a steel frame. Despite its size, its still unfinished, which is not surprising given that a 1921 brochure estimated that it would take 700 years. The cathedral also hosts a barrage of other secrets, including a triptych by Keith Haring and underground studios. Cathedral of St. John the Divine today. Image Public Domain. 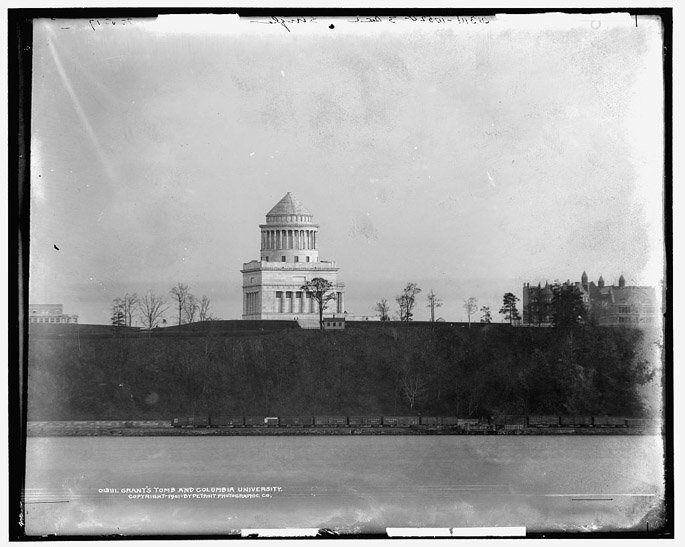 Along the Hudson River, Grant’s Tomb is another unfinished landmark in Morningside Heights. The original plan included a grand staircase and monumental arch but the Great Depression saw to it that the remaining funds were not raised for its completion. Here’s a wonderful image of Grant’s Tomb in 1901, sparsely surrounded by just a few buildings on the northern edge of Columbia’s campus. 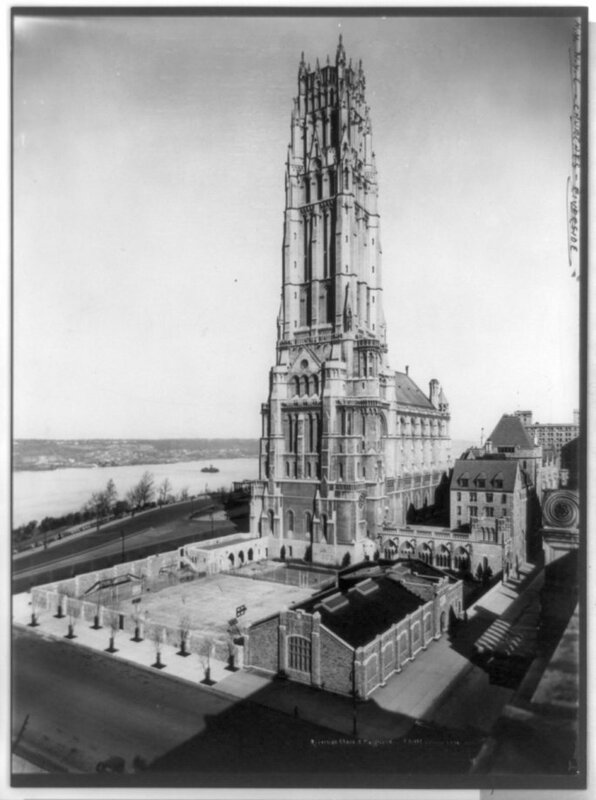 Nearby Riverside Church, the tallest church in America, was built in a neo-Gothic style with a steel frame. It was built between 1927 and 1930. Many of the stately apartments and townhouses in Morningside Heights were built in the early 20th century for the growing middle class. 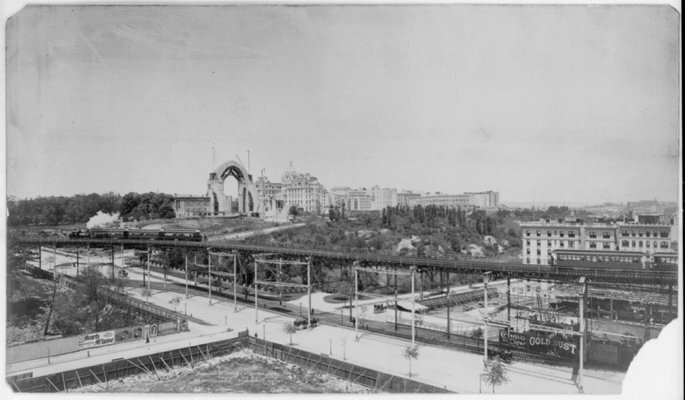 Some notable buildings include the curved Colosseum apartment on Riverside Drive and 116th Street, now owned by Columbia University, and the Henrik Hudson apartments that came replete with a cafe, barber shop, and billiard room. The New York Times described the 1907 Tuscan-style building as “luxuriously modern” for the time. Unfortunately, much of its ornamentation, its “interior and exterior elegance, have been reduced by time, economics and the elements,” says the AIA Guide. Many of these buildings were also the first residential buildings have elevators, a symbol of modern comfort. The Henrik Hudson was one of the many buildings in the area to be converted into S.R.O (Single Room Occupancy) hotels in the 1960s, reflecting the general decline of the neighborhood in the middle of the 20th century. 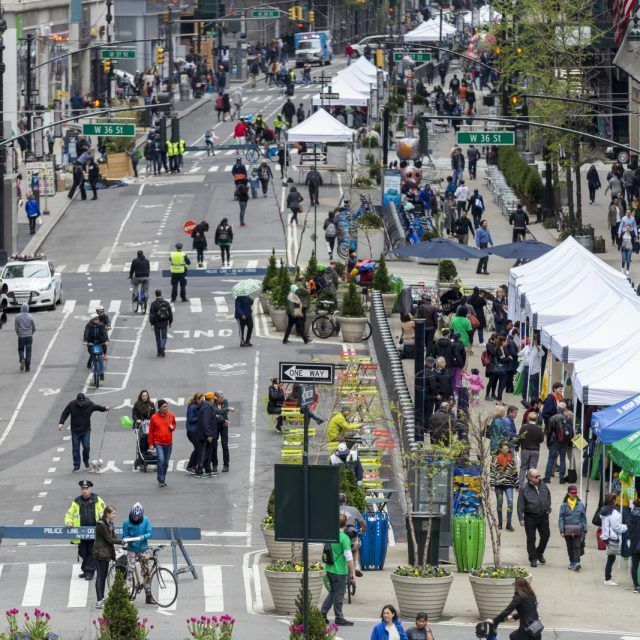 Columbia University purchased much of the area’s real estate during this time but the gentrification feared by students and residents took many decades to come to fruition. Today, Morningside Heights is very much a seamless extension of the Upper West Side with very little marks of the declining neighborhood it once was. 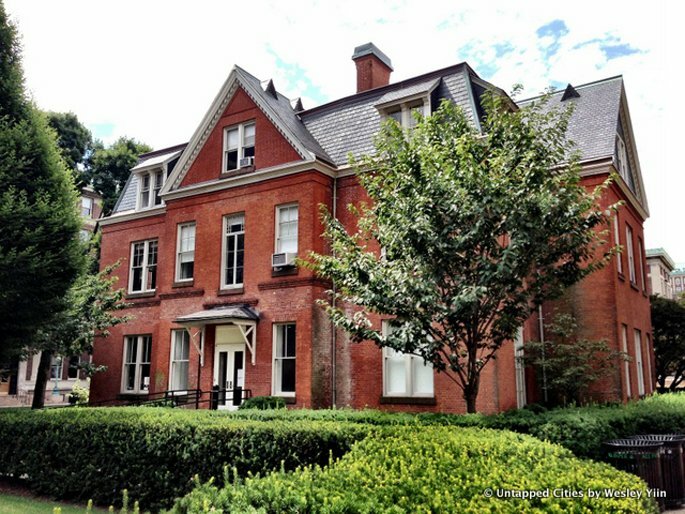 Nor does it bear much resemblance to the farmland and hospital that once defined this part of Manhattan, though the endurance of the educational, healthcare and religious institutions provide a much-appreciated link to its past. Another fascinating piece, Michelle. 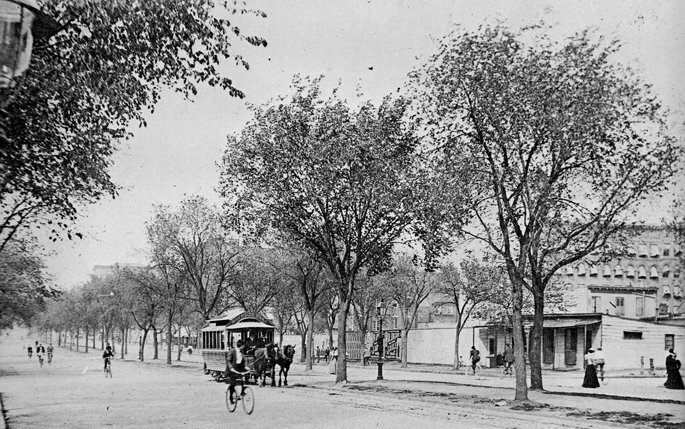 The first image of Broadway back in the 19th century is startling.